This actually took place many years ago. But as timeless as these 4×4 vehicles are, anybody who has owned a Jeep will recognize the excitement and sense of adventure that took place on the day a Jeep I was riding in ended up in the ocean. Jeeps are some tough and rugged off-road machines, that’s for sure! As two young Coast Guard enlisted men, my roommate and I were offered the use of a Jeep CJ5 for the weekend. The Jeep’s owner was headed home on leave, and asked us to keep an eye on it for him. A bit rusty, he wasn’t too concerned about what our destination would be. With his permission, we headed to Nags Head Beach with a couple of friends. Nags Head Beach is located in the northeast corner of North Carolina. The sandy beach runs right by Kill Devil Hills and Kitty Hawk — the place where the Wright Brothers launched their first airplane. Tip #1 When heading to new uncharted territory always let someone back home know your agenda in the event you have problems. When we arrived, we headed straight for the beach and turned north, running along the water’s edge. Tip #2 Lowering the air pressure in your tires will spread the weight over a larger area giving you better flotation when running on sand. With no particular destination in mind, we cruised along at a modest pace. We stopped to investigate a long abandoned Coast Guard life boat station and the Cape Hatterus Lighthouse, then we continued our trip. All the while, we were driving along with the Jeep’s windshield folded down over the hood and the wind blowing through our hair. Tip #3: Carry accurate emergency phone numbers with you in areas that may require specialized equipment to retrieve your Jeep. Along the way, we found a couple of shiny metal surfaces about the size of a car’s roof. They were void of paint, and they shined brightly in the sun. As it turns out, when you get a bit too close to the water (or if you get caught when the tide comes in), your vehicle can become stuck in the sand — with little or no warning. The fact of the matter is… nothing is going to stop the tide from coming in. So, if you fail to get that vehicle free, as soon as the tide reaches the vehicle, the sand around it is washed away and the vehicle disappears — except for that metal surface of the roof! Soon thereafter, the sand washing over it will remove any signs of paint, and there will forever be that reminder of your costly mistake. Tip #4: Know in advance what geographical (or oceanic) obstacles will be encountered along your route. As we continued northward, the idea of driving the beach all the way to Virginia Beach seemed reasonable. We picked up the speed, as the tide was coming in. We were rolling along at about 40 mph — over rises and through shallow dips in the wet sand highway. Tip #5: Always drive at a low enough speed that you will see unforeseen obstacles in time to avoid them. Coughing and sputtering, the Jeep struggled to head for shore. With a quick down shift (and a whole lot of luck) the Jeep managed to drive out of the surf and quickly returned to normal operation. Tip #6: A winch with a long cable and a sand anchor may be your best investment when driving on the beach. We returned to North Carolina on the paved highway — though we got pulled over for having the Jeep windshield folded down. The officer allowed us to continue, as long as we wore sunglasses for eye protection. I guess he knew what it was like to have the wind in your face while enjoying a Jeep ride and having a good time. Tip #7: The most important thing to remember when running the beach: the ocean is salt water. 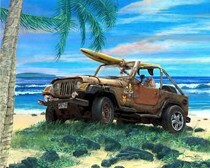 After driving on the beach, you should immediately head for the car wash and clean your Jeep from top to bottom. Otherwise, the salt in the sand will dissolve your beloved Jeep and freeze up accessories (like the winch) in no time.